With the passing of the main holidays of February, things have only calmed down slightly in the village of Wasabi. 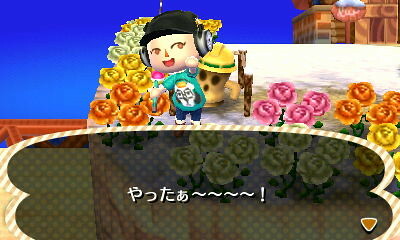 Despite the lack of special visitors, Mayor Neko has been working hard to keep Wasabi growing. This week, the big news in town was that the local salon, Shampoodle’s, located in the Wasabi Strip Mall above the Able Sister’s Shop, has upgraded their services as of 2/18. 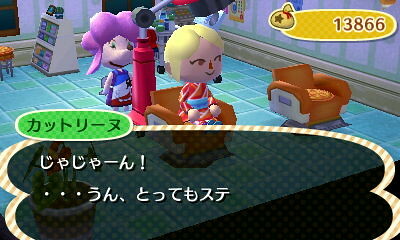 Harriet tells the Wasabi News, “I was finally able to get a new styling machine installed this week! Not only is it much better looking (didn’t you notice the charming red paint and lovely daisy at the top??) but it adds a brand new feature – colored contacts! Now my patrons can really revamp their look with over 16 hairstyles per gender, 13 hair dye colors, and there are now 9 different eye colors to choose from! Come down to Shampoodle’s and get a fabulous makeover today!” Mayor Neko was one of the first customers to try out the new color contacts, opting for a subtle light brown eye color. Crazy Redd was seen in Wasabi on 2/19 touting his black market wares as he normally does. Mayor Neko inspected all the pieces as well as she could, but unfortunately she is not as well versed in art history as she should be, and she neglected to retrieve help from Mayor Yumi. Unable to determine which artwork was not forged, she purchased a large winged statue on a whim. Unfortunately, the statue was rejected by Museum curator Blathers. 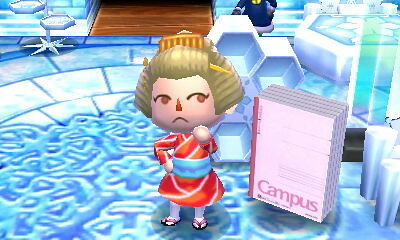 Luckily, on 2/22, Mayor Neko ran into King, who sold her a painting while she was walking around town. 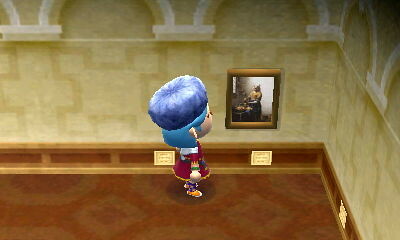 After checking the painting with Blathers, it was deemed legitimate and promptly put on display. Thank you for your help, King! Mayor Neko noticed that Blathers was acting a little strange on 2/18. He had done this once before, when he was feeling homesick for his little sister. 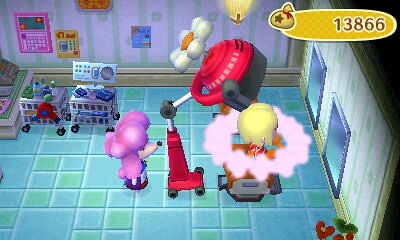 When he told Mayor Neko, she arranged for the Museum upgrade and had Celeste brought in from out of town. Now it seems that Blathers is still not satisfied (after all, there aren’t any other birds besides him and his sister in Wasabi…) and is missing his dearest friend Brewster. Mayor Neko assured the wise bird that as soon as the ongoing Public Works were completed, she’d send for this Brewster character and find a job for him in Wasabi. Mayor Neko and Teddy On a Date?? Less than a week after King had sent a special Valentine’s Day letter to Mayor Neko, our beloved Mayor was seen out dancing with another male! 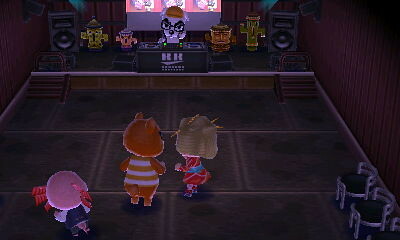 Teddy and Mayor Neko were photographed dancing very close at Club 444 to some DJ K.K. tunes. Dr. Shrunk was quoted as saying, “I saw them dancing together, yeah. But I was also getting my groove on with Mayor Neko that night, so I wouldn’t read too much into it!” King was not available for comment. 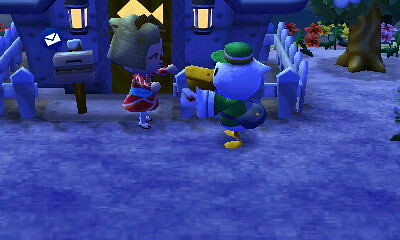 Late in the evening on 2/21, Mayor Neko was surprised to see Pete the Postman waiting outside her door. He was happily delivering a special letter from Nintendo! The latest DLC had finally arrived! This DLC is different from that which can be retrieved at the Post Office. There is a promotion with what appears to be an office supply store in Japan called Kokuyo, and Nintendo has created a special Campus furniture set that will be released one piece at a time. For more information on this DLC promotion, click here. The first Campus DLC item is a Campus Closet, which looks like a pack of notebooks, but can actually be opened and used to access storage! This Campus Closet can also be redesigned in several colors. Thanks to the generous donations of Mayor Neko and the residents of Wasabi, we are proud to announce that the Windmill has been fully funded! 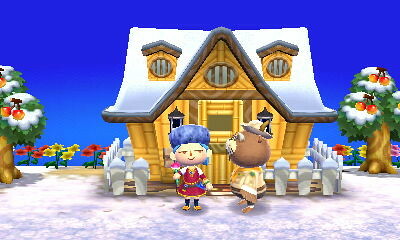 The Wasabi News expects that the Windmill construction will be completed on 2/24. Look for exclusive photos of the newest Public Work in Wasabi to be posted in the next issue. Congrats on King’s donation to the museum. 😉 I haven’t had any townies try and sell me pieces of art, but then again I don’t think any of my villagers are royalty with bells and thrones to spare. LOL! Yeah it’s definitely been a surprise having King as a townie. I will miss him dearly when I start playing in English. I’ll do my best to get him to move to my new town when I start that up in June lol! King has sold me a throne, one of those fancy Greek columns, a fake painting and now a real painting. I also think that Anthony is another ‘rich type’ cuz his house is all Regal Series furniture. 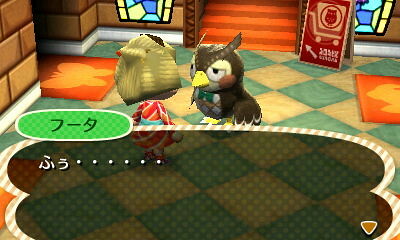 He approached me and offered to sell me [something cuz I never know what they are saying] for over 7,000 bells. Since I always just agree blindly, I was surprised when suddenly he gave me the item without taking my money. I put the mystery item in my house and it was a painting. When I had it authenticated by Blathers, it was fake. So I guess Anthony felt bad about swindling me and gave me his counterfeit painting for free lol! Yaaay! More storage!!! Congrats on the windmill, too! Another excellent edition.